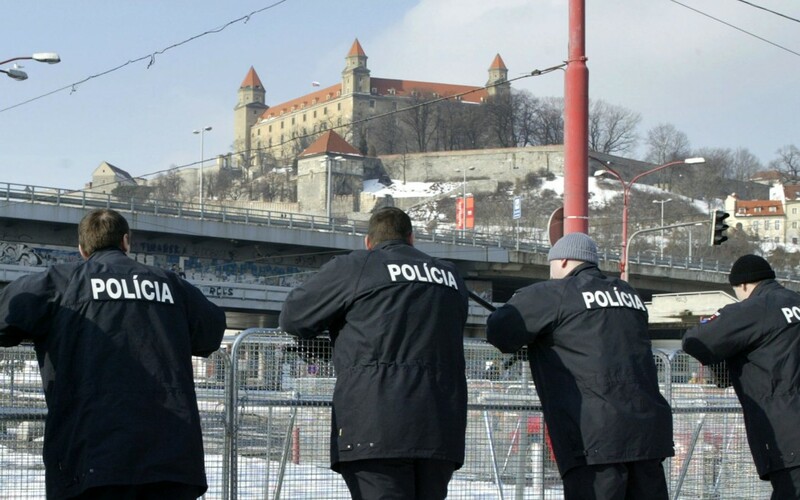 Slovak policemen lean on a fence on the Danube river embankment below Bratislava Castle on February 23, 2005. REUTERS/David W Cerny PJ/WS. VIENNA, Oct 6, 2014 – The International Press Institute (IPI) today welcomed a decision by prosecutors in Slovakia to drop criminal libel charges against journalist Dušan Karolyi. Slovakia’s General Prosecutor, Jaromír Čižnár, announced the move last week after previously committing to review Karolyi’s case in early September following outcry from regional press freedom groups, including IPI’s Slovak National Committee. The charges related to an Aug. 2013 article published in Trend newsmagazine in which Karolyi critically examined a court’s decision one month earlier to drop charges against an agent of Slovakia’s organised-crime task force (ÚBOK) for alleged abuse of power while detaining a suspect 12 years ago. Karolyi wrote that the agent had carried out the arrest, made against the owner of a local real-estate company, as if he had captured a mafia boss. In the article, the case was used to highlight the Slovak business community’s frustration with perceived judicial corruption and law-enforcement failures in the country. Although Karolyi identified the agent only by his first name and last initial, the agent filed criminal libel charges. Had Karolyi been tried and convicted, he would have reportedly faced up to five years in prison. “IPI Slovakia welcomes the fast reaction of the General Prosecutor, who has overruled the decision of the lower prosecutor office in the region of Prešov in the case of the journalist Dušan Karolyi. IPI Slovakia hopes that this could indicate a new trend in similar cases of the absurd prosecution of journalists for doing their job”, Pavol Múdry, chair of IPI’s Slovak National Committee and member of the IPI Executive Board, commented. Slovakian criminal defamation law is currently among the harshest in the EU. Under Article 373 of the Slovak Penal Code, offenders generally face up to two years in prison. However, if a defamatory statement causes substantial damage, the maximum punishment rises to five years. If the statement leads to “large-scale” damage such as loss of employment or divorce, the punishment is three to eight years in prison. In July, IPI released a comprehensive report on defamation law in the EU, which indicated that the vast majority of member states fell dramatically short of fulfilling relevant international standards. Notably, 23 out of 28 states have failed to repeal criminal defamation laws. A staggering 20 out of those 23, including Slovakia, continue to contemplate imprisonment as a possible punishment for defamation.